Gold is a rare metallic element, with the atomic number 79 and the symbol Au. While the name gold comes from an Old English word meaning yellow, the symbol comes from the Latin aurum, which means “shining dawn.” On the periodic table of elements, gold is found in Group 11, along with silver, copper, and roentgenium, and in Period 6 between platinum and mercury. It is referred to as a “transition metal.” Gold is the most malleable, ductile metal (Gold is so pliable that it can be made into sewing thread. Just 30g of gold can be stretched over 50 miles). Gold is one of the so-called precious metals, along with platinum and silver. Gold has a melting point of 1064.43°C. It can conduct both heat and electricity and it never rusts. Gold, as a precious metal, has been valued and held in high esteem since ancient times and is still one of the most highly prized metals. Some speculate that gold is probably the earliest known metal because it has been found in tombs and among artifacts dating back to the earliest known civilizations - gold was used as early as 6000 B.C. Easily shaped, carved, melted, chiseled or hammered, gold is one of the softest, densest, metals that exist. Because it is so soft, it is alloyed with other minerals like silver and platinum to make it stronger and more durable. It is the metal most often used by jewelers and other artisans because of its flexibility and it's durability and it is not easily affected by moisture, normal heat, air, or everyday wear and tear. Because gold is a very good conductor of electricity and heat, it is widely used for industrial purposes and manufacturing applications. Gold was once used extensively as dentures and dental fillings because of it's soft demeanor and it's easiness to shape. Although it is still used in some dental applications, it is not used for dentistry purposes as extensively today. 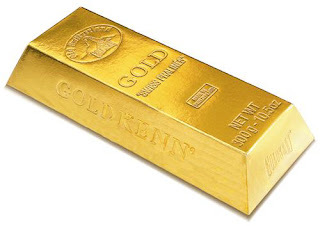 Other uses of gold include biological and medical research, photographic imaging, and because it is has a high resistance to corrosion, it is used in sensitive electronic instruments and computer chips. Your mobile phone and calculator probably contain some gold. Here's an interesting fact - gold is actually edible. Some Asian countries put gold in fruit, jelly snacks, coffee, and tea. Since at least the 1500s, Europeans have been putting gold leaf in bottles of liquor, such as Danziger Goldwasser and Goldschlager. It is also thought to have some medicinal functions, possibly for treating arthritis.